I had read my first copy of Hoehner years ago and have since lost the copy. I was glad for the chance to read him again. If you enjoy New Testament history and the Life of Christ in any way you have to enjoy a book like this. Setting the times and dates in the New Testament is always a difficult task and it is one of the things about which we can be easily mistaken. 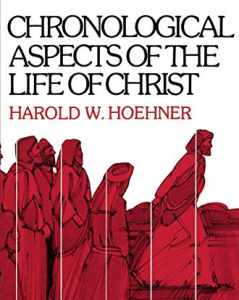 Hoehner deals with dates from the birth of Christ through the crucifixion and ends with a great chapter on Daniel’s seventy weeks which, of course, gives us the date for the start of the passion week. Hoehner has become a standard for a conservative, evangelical view on these things. He is a Dallas Seminary graduate who holds to a traditional eschatology.